We teach kids the correct way to swim so they’re safer, faster. Trainer.ae is a highly-successful, fun and innovative way for your child to learn to swim correctly, safely and quickly. We are often the place that “works” when other lessons haven’t. We believe learning to swim should be fun, not intimidating. Our small, warm water pools help children discover confidence and joy in the water without the fears and distractions that can come with large, crowded swim classes. 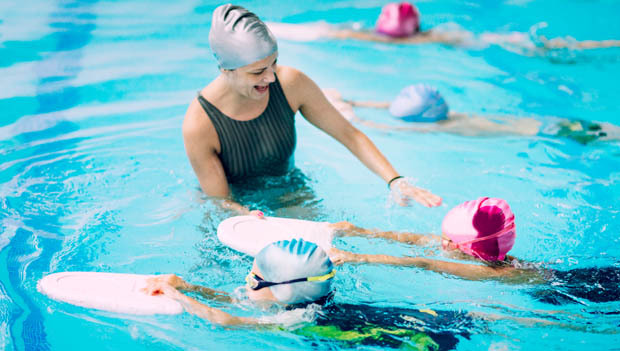 Our highly-trained instructors can stay focused on your child throughout the lesson and your child can stay focused on the joy of learning to swim. Kids learn best by seeing, so that’s exactly how we teach them to swim. We use innovative technology including instant video feedback and mirrors on the bottom of the pool to help even the youngest new swimmers learn the correct technique, apply what they learn instantly, and quickly gain the skills they need to be safer in the water. This is the same technology Olympic swimmers use to train, yet it is also the perfect way for toddlers to get in the swim of things. Our technology helps us teach kids the most correct methods of swimming, making them safer and giving them a stronger foundation to continue to improve and excel in swimming as they grow. Fun and welcoming for parents, too. As a parent, you’ll enjoy the fun and the advantage of getting to see your child’s learning take place right before your eyes on our video screen. Trainer.ae offers private, semi-private, three-person private, and four-person private lessons for children. The private and semi-private swimming lessons are structured to advance through the Trainer. ae progression at an accelerated rate based on your child’s abilities. These private lessons offer flexible scheduling and the opportunity to request the same instructor for every lesson. For families with multiple children, our instructors are successfully able to work with different ages and abilities during these lessons. In our group classes, we guarantee no more than 4 students in any class. This allows our instructors to effectively spend quality time with each student in the class, ensuring that everyone progresses evenly. Trainer.ae is a competitive swim Company. This means that while we focus on ensuring that each and every student is “water safe”, we also ensure that all of our students know how to swim each of the four competitive strokes competently. At Trainer.ae we always offering flexible schedules, meaning you can start your swimmer at any point. We schedule group lessons in increments of four weeks with a consistent day and time. Because our group lessons are in such high demand, we recommend signing up for Auto Pay, which reserves your child’s spot indefinitely until you notify us otherwise. 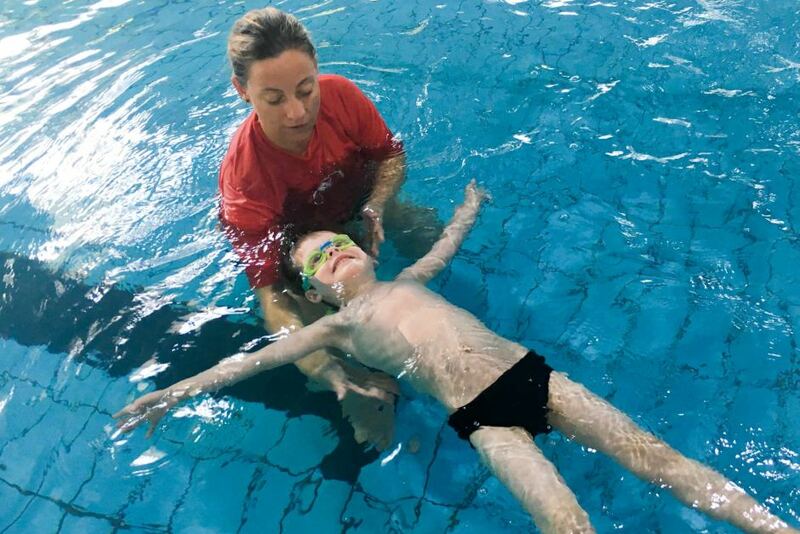 Our curriculum has been developed by a team of world-class swimmers with over 20 years of teaching experience. We have the most up-to-date swimming technique to teach students how to swim the correct way right from the beginning! In addition to teaching water safety to every swimmer, our goal is to teach confidence in the water that will translate to all parts of your swimmer’s life. Whether the goal is water safety skills or competing at an elite level, our program is designed to teach all ages and abilities. Our curriculum uses a progressive teaching approach that allows for your swimmer to learn to swim comfortably at an individual pace while creating a learning environment that is not only fun but allows for maximum skill retention. We are fiercely passionate about swimming and we are excited to take your swimmer from bubbles to butterfly! Contact Us: fill in the form below. You can get in touch with us 24/7 and one of our experts will not only give you a free consultation but also help you pick out an appropriate male or female personal trainer to meet your needs. One-on-one personal training lessons are available in Dubai, Abu Dhabi, Sharjah, Ajman, and RAK. Posted on 1st March 2019 by Jack collins. This entry was posted in Swimming, Swimming for kids and tagged Kids Swimming. Bookmark the permalink.